Gypsies for a wedding party! Gypsies for an evening party! Gypsies will welcome your guests! Gypsies will add joy to your anniversary! Gypsies will come to your birthday! Gypsies will offer an apology for you! 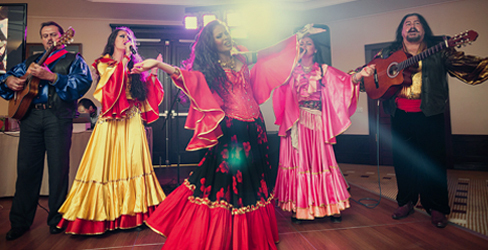 Gypsies will come to your New Year party! Gypsies will do a circle dance! Gypsies will brighten up you party! And will turn your special event into an adventure! Give a surprise to your close and dear friends! Engage Roma for your company’s New Year party, for a wedding or anniversary! Our Gypsies will bring infinite joy and merriment to everybody! Order Roma performance for a special occasion – and it will be the brightest, funniest and most memorable evening of your life!